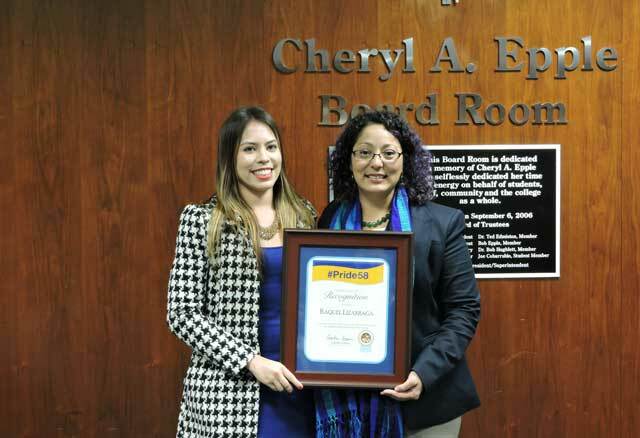 Raquel Lizarraga is an administrative clerk for Cerritos College's Technology division and recently, she received the prestigious President’s Volunteer Service Award from the White House. She was honored for her 400 hours of service to the nonprofit group, International Surf Lifesaving Association (ISLA). Raquel served as a student consultant for ISLA, where she discovered that drowning is a leading cause of death across the world. Realizing she could raise awareness through social media to educate, and prevent drowning, Raquel began volunteering at ISLA. She currently serves as Vice President of Development at ISLA, and travels across the globe leading teams of volunteers, creating social media campaigns and educating local populations about drowning prevention through social media strategies. Thank you Raquel for being a great ambassador for the International Surf Lifesaving Association and for your commitment to water safety and saving lives, at home and across the world. 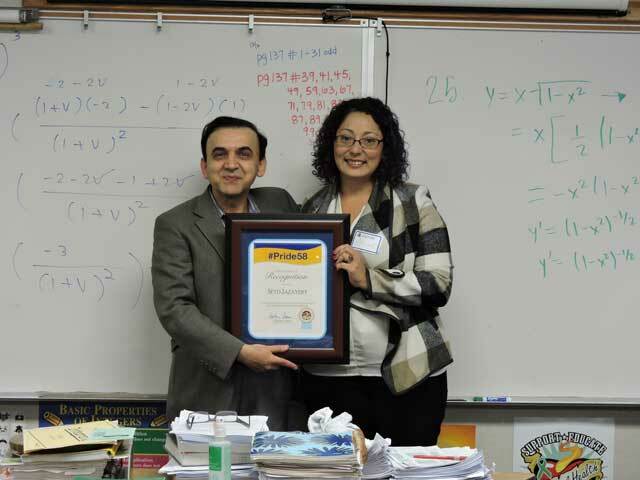 For over 20 years, Mr. “Jaz” has selflessly served Bell Gardens High School students as a teacher, mentor and friend. Each day he welcomes his students with a warm smile and nutritious snacks that satisfy their growling stomachs. He proudly supports all of the school’s sports teams, attending both home and away games. As a generous benefactor, he donates money out of his own pocket to high school seniors who are moving to a college or university. Thank you, Seyd Jazayery, Mr. “Jaz,” for being a dependable, determined and devoted teacher – a true mentor and role model who works every day to inspire and transform the lives of our youth. In April the Club will celebrate 100 years of community service to Artesia and Cerritos and other organizations outside of these cities. The Woman’s Club lends a hand to Su Casa, Community Family Guidance, to the Tracy High School Teen Parent Program, Wounded Warriors, the Fisher House for Veterans, Ronald McDonald House, the USO, the 1st CEB Marines of Camp Pendleton and many other philanthropic organizations. 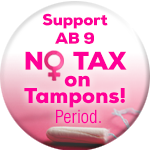 Not only do they contribute financially, they also collect various items each month to give to different causes. These items range from school supplies to paperback books for veterans, to diapers and baby products for the Teen Parent Program, to footwear for the women and children of Su Casa. 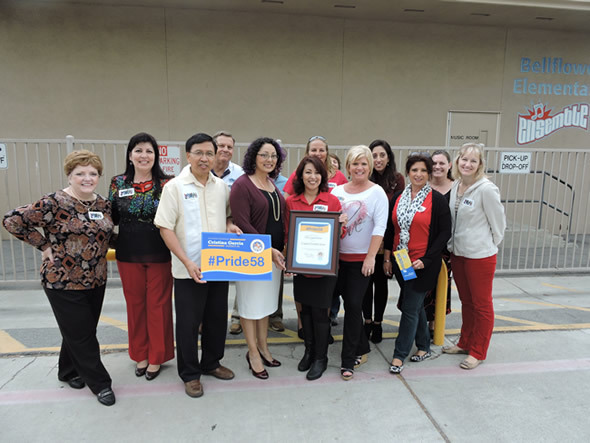 Thank you to the Woman’s Club of Artesia-Cerritos for pitching in and making life better in our local communities. The Hook Up Resource Center offers resume assistance, job search services, textbook loan, a study area, art and music lessons, internet access, computers, printing, food and clothing. Esperanza Ortega and William Valenzuela personally run and fund this center to provide special assistance to veterans and the homeless. The inspiration behind The Hook Up is from Esperanza Ortega and William Valenzuela participating in the Occupy movement at E.L.A.C. when they found that many students were homeless. Wanting to do something to assist students, they started the resource center. There is no cost to use any of the services and special assistance is given to veterans and the homeless. The couple freely offers anything that individuals or families may need including food and clothing. The hook up center is a very important resource to our veterans and those less fortunate in our community. Every Thursday the Hook Up center supplies food to our veterans and others in need. They also assist our veterans with housing, jobs, food and other services. Recently, William and Esperanza renovated their Almost Home Transitional Housing for Women Veterans. The new renovations give more opportunities for women veterans to have a place to stay in a safe, caring environment. The Hook Up Center gives our community hope and is a reminder that there are still special people like Esperanza and William who care and are willing to help. 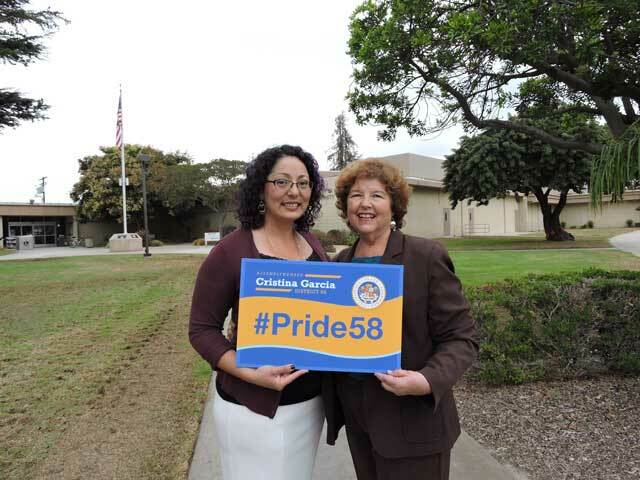 Betty shows her #pride58 by giving back to the city where she was born and raised, Artesia. Retired from working for the City of Artesia, Betty is always active in her community. She is currently a member of the City of Artesia Public Safety Commission, Chairperson for the Red Ribbon Program, a Neighborhood Watch Block Captain, Artesia Historical Society Board Member and is a docent for the Historical House and Fire Station #30 Museums. Betty is the former President of Our Lady of Fatima School parents committee and former President of The Council of Catholic Women. Currently she is a member of Holy Family Pastoral Council, volunteers at the Religious Articles store every Saturday and serves as a Hospitality Minister during Saturday 5PM mass. She also teaches 1st Grade students in the Religious Education Program at Holy Family Church and is a committee member for Emergency Preparedness team at the church. Betty is a caring and passionate person who is always giving back to Artesia and by example, teaching others the value of community service. Caring Connections works with the Bellflower Unified School District by placing case managers in schools to connect families with services. They provide a wide variety of services to families in need, including health care, clothes and parental training. Dr. Hansen works in the community as a dentist carrying his family’s legacy of dentistry. In addition to striving to improve the oral health of his patients, Dr. Hansen is committed to his community. He is involved in the Montebello Chamber of Commerce, where he has served twice as Chairman. He is also an active board member and former Chair of the Montebello-Commerce YMCA. He also serves on a leadership position on the Beverly Hospital Foundation. Dr. Hansen also spends his time volunteering at preschools and health fairs promoting healthy dental care. Dentistry is Dr. Hansen’s passion, which is why he continues to serve as Program Chair for the 900 dentists who are members of the San Gabriel Valley Dental Society. He has always been involved in all capacities of that organization, including former-President. Dorothy Owen became a resident of Cerritos in 1969. She was self-employed for 20 years, manufacturing and marketing her husband’s patented invention, Cyberchess, and later on conducting a computer consulting service. During that time, the Owens joined the Cerritos Chamber of Commerce and the Artesia Chamber of Commerce, where they served on the Boards of Directors. Norbert (Bob) was also a member of the Optimists Club. After being ill, he passed away in 1997. 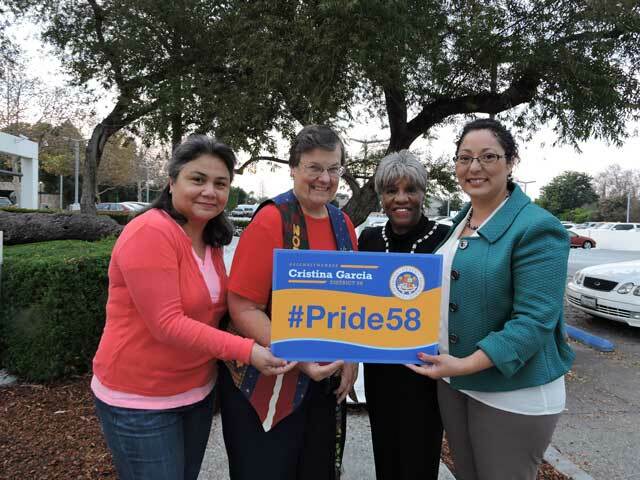 Dorothy continued to reside in Cerritos with their daughter Tracy and volunteered with the Woman's Club of Artesia-Cerritos and the ABC Unified School District. In 2006, Dorothy Owen married Sgt Maj (ret) David W. Owen. David served his country for 30 years in the United States Marine Corps and completed three combat tours in Vietnam. The couple answered Chuck Sooter's call for community support for the City of Cerritos to adopt the 1st CEB and became members of the original 1st CEB Adoption Committee's Board of Directors. David taught Dorothy that birthdays are important to Marines. Being the 235th Birthday of the Marine Corps, 2010 was especially memorable. Dave celebrated his 50th Marine Corps birthday on October 10, 2007, the same day the Friends of the 1st CEB gathered their first care package shipment to the deployed 1st CEB in Iraq. David developed the protocol and administered their Meritorious Marine program. He suddenly passed away in 2008. Since then, Dorothy continues to carry on doing what he did to support our brave, young Marines of the 1st CEB. 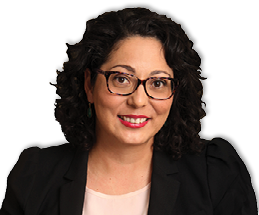 Dorothy is proud to be an Ambassador for the Cerritos Chamber of Commerce, currently representing the 1st CEB Adoption Committee. Dorothy Owen also sits on the Board of Su Casa.